If Italy is well-known for its romanticism and gastronomy, its cultural heritage remains one of the most important in the world. Michelangelo, Botticelli, De Vinci are some of the internationally known artists who made of Italy the land of Renaissance Art. Emblematic of this period, Florence reunites each year visitors from all over the world willing to discover this history. Romantic, the city is also ideal for couples or families. Villanovo invites you to travel one day in the famous Tuscany capital. Largest green space of the city, this magnificent garden covers 45 000m2. Visited for its sumptuous landscapes and its Roman sculptures from the XVI and XVIIe century, Boboli gardens runites more than 800 000 visitors per year. Initially made for Cosimo I de’ Medici, the responsibility of the project of this garden has been delegated to several architects over time. It was indeed worth it because it is today one of the most famous gardens in Europe. 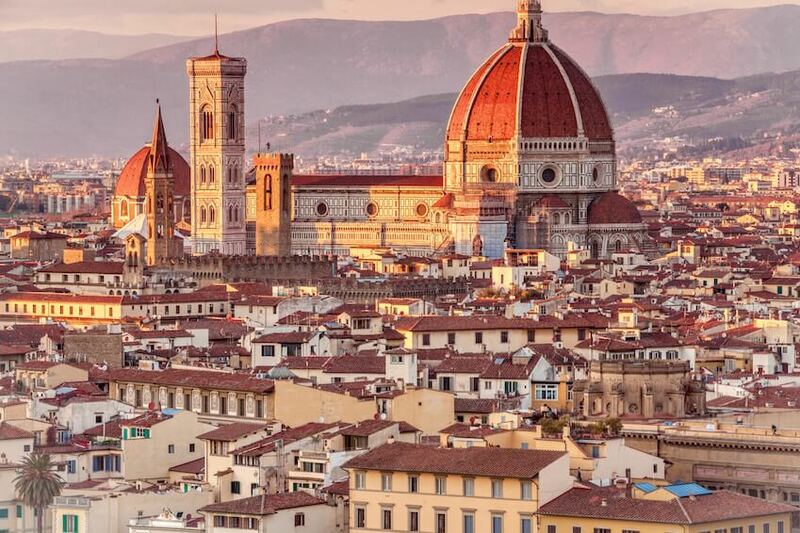 Also called the Duomo because of its impressive dome created by the architect Filippo Brunelleschi in 1436, the cathedrale is the symbol of the beginning of the Renaissance architecture. Listed as Unesco World Heritage site since 1982, it is today the 5th biggest church of Europe by size. Visit its interior and admire its huge fresco which runs over 3600 m2 made by the famous artists Giorgo Vasari and Federigo Zuccaro. Central museum created in 1562, the edifice hosts among others the masterpiece of Renaissance art: David from Michelangelo. Portraying David naked before his fight against Goliath, the sculpture symbolises a young republic facing its tyrant. Initially placed in front of the Palazzo Vecchio, the David has been moved to the Galleria in 1873 and is today the most emblematic work of art of the museum. Being one of the main catholic place of worship, this is where you will find some of the most beautiful graves such as the Medici family. Faithful to the typical architecture of the city, art enthusiasts won’t be disappointed! 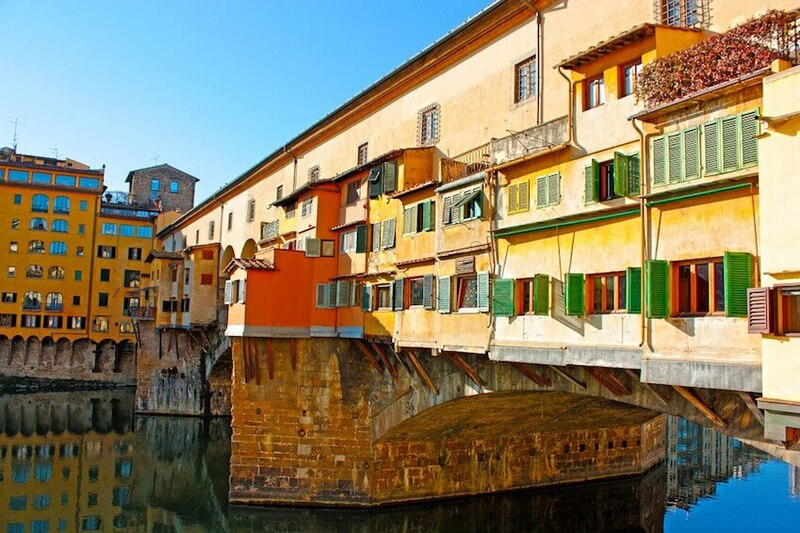 At last, the area is very close to Ponte Vecchio, the oldest bridge of the city. Pedestrian zone housing shopping malls, its first construction in wood goes back to the Roman Empire. Today, the bridge is also a place of finest jewellery of the city and the whole country. If all these visits have whet your appetite, try the refined specialties of Bottega del Buon Caffe. This gastronomic restaurant reinvented the italian cuisine and accompanies it with the best wines in the world to make you live a unique culinary experience. Very appreciated from fine palates, the place seduces also by its charming staff and authentic decor of stone walls. 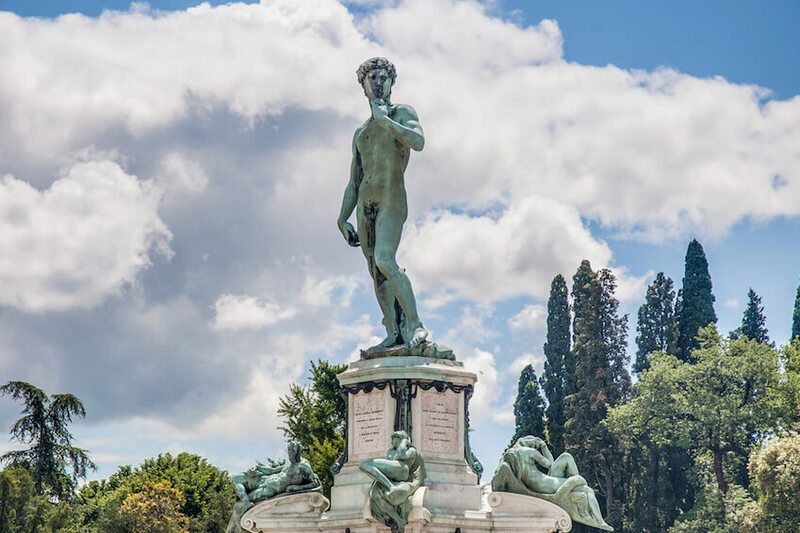 If you like panoramic views, head to Piazzale Michelangelo for the best of view in the city! By foot or with taxi, go to the place to admire a spectacular sunset with a breathtaking view on the whole city. Finally, after a full day, indulge yourself with a well-deserved pleasure: a traditional gelateria in one of the best ice-cream makers of the the country. It is well known, Italians are subject matter experts! And it is not the clients of Santa Trinita who will say the opposite. Its ice creams, sorbets and frozen yogurts have seduced the italian public thanks to classics well achieved and touches of extravagance in several flavors such as the original mascarpone-honey. Taste it yourself!